A digital identity | One year, one job. My digital identity was created a long time ago. Back in the days of Piczo and Geocities, I began constructing my first individual identity (Martin, 2008) which I’ve continued to develop. Nowadays, my footprint is much bigger. 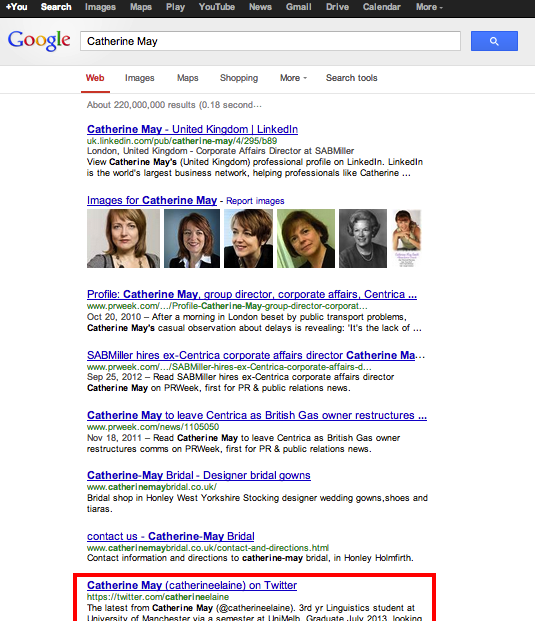 In fact, so much of myself is now online that I appear on the top page of Google for the search ‘Catherine May’. Fortunately, a more successful Catherine May beats me to the top image spots. There were days when I used to be ‘anonymous’ on the web. Or so I thought. I chose to show different windows of my identity in different places, withholding certain information. I created a fragmented ‘identity’ for myself on Myspace and forums. In 2009, things changed for my online identity. I gained an understanding of the difference between public and private and ensured my privacy settings on Facebook were locked, and this new-fangled Twitter account of mine could be viewable to everyone. A year later, I put more of myself publicly online with the creation of my first WordPress blog. With my words now public, I started to think about who would read them and soon I created my first imagined audiences (Marwick and Boyd, 2010). Initially, I made the error of thinking of myself as my audience and wrote about things that only interested me. Boyd and Ellison (2007; 10) found that social networks “are structured as personal (or ‘egocentric’) networks, with the individual at the center of their own community” and, upon reflection, I think a large factor in my initial usage of the internet could be described as a curious egocentrism. Times changed and so too did my imagined audience. I decided my audience would be people who enjoyed reading music reviews. 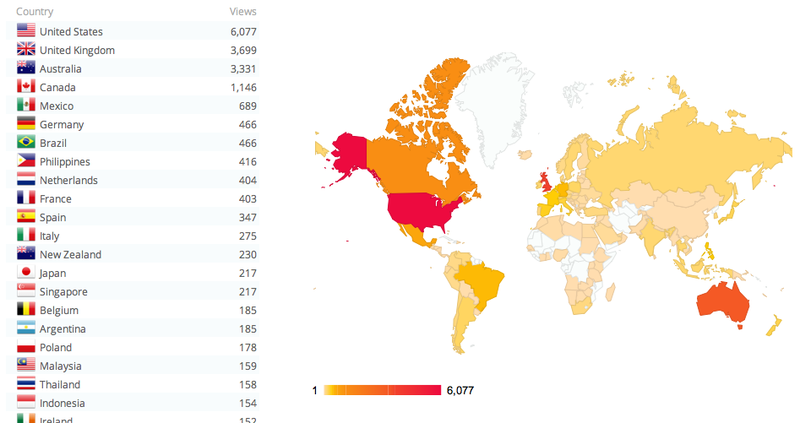 I imagined (and my WordPress stats and Twitter followers supported) that my audience were largely British, however I quickly found Australian and American readers. As my digital identity grew, my imagined audience narrowed. Actually, my imagined audience grew too, but I began to consider that different parts of my online identity would have different audiences. My Facebook remains ‘private’ and so my identity there is presented to a small audience of only those who know me personally. I can share family photos, life updates and post on my friends’ timelines. On Facebook, my audience is restricted and hence my imagined audience over there is probably more targeted and accurate than on more public sites. With this blog, I imagine my audience to include students and media professionals as well as those who are my friends and family in the offline world. As the audience is not restricted, I sometimes question whether I should be concerned with the information I make public. On a personal and professional level, I share a lot of information, but this has never caused concern for me. Do I make the most of my digital footprint professionally? I certainly try to. I’ve used a combination of tweets, blogs and LinkedIn to find myself work experience which ultimately landed me my first graduate job. So who is my imagined audience for this piece? Well, I always believe the best blog posts invite a response, so feel free to tell me. My digital footprint is very public and ever-expanding. And for me, that’s pretty exciting. I put things online for a reason – because they are a part of my identity – and I don’t mind who sees them. Who are you and what would you say are the major aspects of your digital identity? The “Facebook” category allowed me to find this blog post. My interest is the relationship people have with the internet, the boundaries they set between private and public. I didn’t consider the people who come across my posts through the tags, but it’s definitely something worth considering so thanks for commenting. I think the boundaries between private and public are very interesting and definitely not as clear cut as some people may think. The 2007 Boyd article I’ve linked to has a lot to say about what ‘public’ means and how there can be many different examples of ‘the public’. It’s worth a read if you’re interested. Also found this through facebook. Although I sometimes used to try to keep separate online identities when I was younger, mainly for playing computer games, I’ve basically given up now. I’ve come to the point of view that if something’s online it’s not really private, regardless of what I think about that ethically it’s essentially the reality of it. If someone wants your private information badly enough they can find a way to get it. Fascinating stuff, on so many fronts – from the stat snapshot, to the timeline observations. Thanks for the post. Some great questions and reflections, Catherine! I got this through signing up to receive your regular musings. The fragmented aspect is really interesting, how aspects of ourselves are presented but never the whole. We have a sense of that but others get glimpses. Like catching ourselves in a window reflection, you only get a certain angle. The privacy debate is a biggie and worthy of further musings? You make some excellent points Catherine, it’s very interesting to read. My own personal digital identity is limited to a private Facebook account and more recently Twitter. I did have a blog although deleted my posts after being concerned over how my musings may be recieved by difference audiences. However, now I wonder, can anything ever really be deleted from the internet, and can anyone really be anonymous?